Brewers Game Signup Extended till chapter Mtg – May 15th! I just wanted to let everyone know that I extended the due date for the Brewers game with the Kirkwood Chapter. All money is due by the chapter meeting on May 15th. Reminder: Swap Meet – SAT APRIL 21st!! Good Morning Milwaukee Chapter with the Swap Meet less than two weeks away I would like to remind everyone to come out and support this event that we are having for our Chapter Charity (C.O.P.S.). Even if you aren’t displaying your goods to sell PLEASE come and check us out. You never know what you may find!!! Come one come all!! All are invited to learn, share, and exchange details, tips, and hints on how to plan a successful ride. What goes into it, and what makes a great ride successful. Good Morning Milwaukee Chapter! Spring and good weather for riding is just around the corner. There are still some loose ends to tie up from the 2017 Mileage Program. ending Mileage in order to add it to the total Chapter mileage. You can also email me at: jayne_tgwth@sbcglobal.net. Here is an awesome opportunity to meet up with another chapter and have some fun! On Friday June 22nd the Kirkwood HOG Chapter set up a group event to go see the beloved Milwaukee Brewers vs St. Louis Cardinals. We will meet at the House of Harley and ride down together to the game. Kick stands up at 5:30 pm. Tickets are $17 per person. Money is due May 1st. We have 100 seats reserved in Section 207 and we can get more! Hello Chapter Members! The calendar from the Chrome Chronical has the wrong date for the March Brunch. The March Brunch is March 10th at the Delafield Brewhaus. Saturday March 3rd is the last day to sign up. I hope to see everyone there. The shortest month of the year is here, the sun is rising earlier and setting later and riding season is right around the corner! Just a quick reminder, this month’s Chapter Meeting will be another Social Night at Root River Center, Feb. 20 6-10pm. BUT WAIT… THERE’S MORE!!!! We will also be verifying mileage for the RIDE365 program at this meeting. 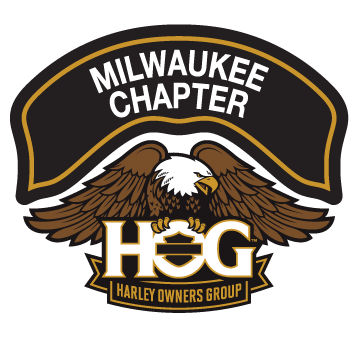 If you would like to sign up, remember this will not only count for the Official HOG competition and yearly rewards but also our Chapter Mileage for 2018, please bring a picture of your VIN # and a picture of your odometer. Bike in storage? NO PROBLEM, bring the paperwork along that shows the mileage when it was checked in for storage. I will have the HOG forms for you to fill out!!!! Let’s play some games, socialize, get our mileage in and get ready for the riding season!!!! Remember that if you are interested in going to the hockey game money is due February 12th. I will be at bowling on February 3rd and for the chapter game night. It’s $20 a person and part of the money is going to charity. Just a reminder that sign up for the chapter brunch by February 3rd so I can get a head count. If you have reserved a seat in the LOH Gambling Trip on 3/24/18, your money ($32) is due by 2/28/18. You can pay Donna or Joolz at Bowling or at other Chapter events. You can also contact Joolz to make arrangements to get payment in. Your chapter board has decided to explore fundraising opportunities for 2018. A sub-committee has been formed to provide ideas and chapter opportunities to raise money for our charities and operating expenses. Those who have volunteered for the sub-committee include our new secretary, Terri Warren, Pauly, and myself. We would like to recruit additional members to serve on this sub-committee. A minimal time commitment of approximately 1-2 hours/month would be expected. One of our goals is to get a voice from the general membership. If this sounds like something you would like to be a part of, please let me know. Call me, email, or send me a text. We would love to have the participation from you! Open to everyone, but limited seating, so reserve your seat early!! Due to conflicting schedules of events, we are going to reschedule the outing to the Admirals game on February 10th. The new date will be Sunday March 4th at 5:00pm. On that day they will also have a Battle of the Badges Game at noon with proceeds going to charity, one of which is COPS. We feel that this day better supports our charity, and the Chapter’s and House of Harley’s relationship with COPS. We encourage you to attend the Kill Winter party at House of Harley on Feb 10th. Please see the House of Harley website for times. I will have more information about the game soon. In place of a Chapter Meeting on January 16th, we will be having a Social Night at Root River Center, 6-10pm. Holiday Party tickets will be available to purchase. Feel free to bring board games, card games, poker chips, or just your smiling face!!! Hope to see you all there for a night of fun!! !